Html To Excel .NET converter - Converts Html to Excel files XLSX XLS CSV in C#, VB.NET. Converter Html To Excel .NET contains all the features needed to export Html to Excel from .NET applications and website projects (C# VB.NET). The converter replaces whole Html document and its formatting on the table of Excel spreadsheet automaticaly adjust cell heights and widths. Also Html To Excel converter has capability to read / edit / write Excel files ( XLSX , XLS , CSV ). Accurate output is the most important thing at export Html to Excel. The resulting Excel XLS or XLSX files are equal to the source Html file with all the cells, images and symbols. Html To Excel .NET converter helps to export template of HTML table to Excel file that can be edited at developer's discretion. The set of API functions allows developers to manipulate with Excel data up to Excel Cell value and its styles, fonts, colors, borders etc. Apply different Colors to Cells, Fonts, Gridlines, Fill to Drawings. 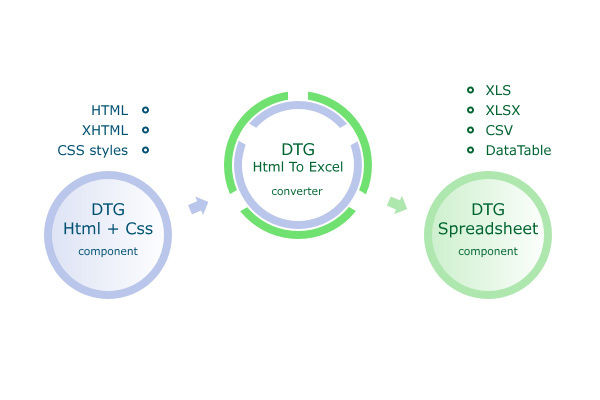 Supported file formats, HTML & Excel documents, converting capabilities of Html To Excel .NET converter.